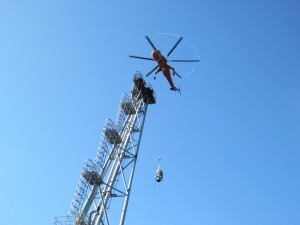 Mechanical handling; either by means of the original handling system designed into the flare boom or flare tower. This is often the best option on a cost basis, providing time restraints are not an issue. Original handling equipment on older structures could be damaged and found inoperative. Prior to use they should be proof tested. Should the original handling equipment be damaged, experienced installation companies are available. These companies use their own “in house” methods, processes and equipment for a bespoke Tip change-out. Helicopter: this is an approach that over the past two decades has grown both in acceptance and popularity principally because of the reduced time and manpower required. Following the very detailed procedures and HAZOPs, developed in coordination with the operator, the change-out is generally completed within one working day from start to finish even where multiple flares are involved.